Since opening in 2001, Global Dental Solutions has provided dentists throughout the United States with quality, affordable dental restorations. As technology has grown, so has the product offerings which now include screw retained fixed detachables (hybrid dentures on Ti-bars), screw retained full arch zirconia restorations, and CBCT surgical guides, to name a few. We are full service. In our dental lab, we fabricate a wide array of restorations; Whether you need crowns, bridges, dentures, surgical guides, night guards, or most any other restoration, we can provide you with the right solution in a timely fashion. You can choose from a variety of materials and we can discuss with you the best one to meet your patient’s needs. We customize every solution to suit our customers’ specific requirements, through the use of our Doctor Preference Profile (found below) and open communication. Ordering from us is easy. If you are a dentist, or working on behalf of a dentist, and wish to send us an email, please send us a message at sales@globaldentalsolutions.com and we will reply promptly. If you prefer to contact us by phone, we are happy to receive your call at (866) 905-1111. We are pleased that you have decided to put your trust in our ability to get the job done. On our printable RX form, you’ll find everything you need to place an order with us for your specific patient. We ask you to complete every detail required, including restoration and stump shade (if applicable), type of restoration requested, alloy or material desired, and the date and time of the patient’s appointment. Please take notice of the Doctor Preference Profile shown to the right so we can learn exactly how you want us to fabricate your cases. Our job is to make yours easier. Each clinician we serve is unique and has their own ideas of what works best for fabrication. 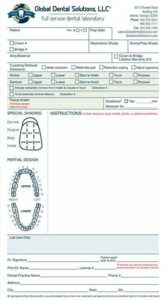 There are several important choices to be made, such as broad or pinpoint interproximal contacts. All of these choices directly impact the successful seating of the prescribed restorations. 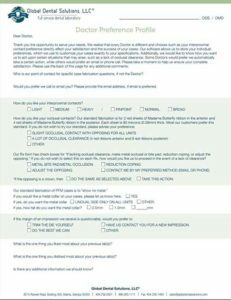 As such, we request you fill out the Doctor Preference Profile, so we can customize each restoration to your preferences. Our software allows us to retain your individual requirements and conveniently access them throughout the fabrication process. We also want to know more about your feedback in prior lab usage, so we can be sure to exceed your expectations now, and in the future. To be notified by email each time a case ships to you, please complete our Email Address Request Form.